01 February 2019 (Toronto, ON) - The world-famous André Rieu is undoubtedly one of the most successful musicians of our time. With 90 concerts a year and more than 40 million albums sold, the 'King of the Waltz' has won millions of fans around the globe. His concert tours regularly rank among the Top Ten Billboard Touring Charts of the most successful shows worldwide. 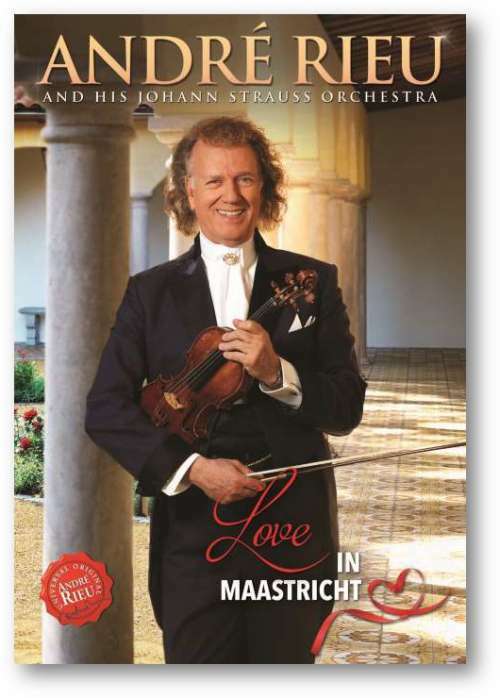 André Rieu gives special open-air concerts each year in his home town of Maastricht. Annually, tens of thousands flock from all corners of the world to attend one of the most emotional live music experiences possible, set against the beautiful backdrop of the medieval town square. With a record number of 13 events, André Rieu thrilled more than 150,000 fans from 80 countries on the Vrijthof square! 28 cameras captured the most memorable and emotional moments on the stage and among concertgoers over three days. Recorded live in July 2018, the DVD features thirty fantastic tracks: romantic waltzes, popular arias such as “Nessun Dorma” from Giacomo Puccini, world-famous melodies including “Granada”, “You’ll Never Walk Alone”, the “Snow Waltz”, and the “Radetzky March”; global hits like “Can’t Help Falling In Love”, and goosebumps-inducing interpretations of “You Raise Me Up” and “Lara’s Theme” from the famous film, Doctor Zhivago. André Rieu is unparalleled in his ability to interact with his audience from the stage and succeeds in getting everyone up on their feet with his fantastic blend of waltzes, music from movies, musicals, and the opera, and hit songs. By the time the world-famous “The Blue Danube” waltz from Johann Strauss is played, at the close, the aisles are thronged with thousands of dancing audience members. Of course, viewers can look forward to a number of very special guest stars this time around as well: Los del Rio kept the great mood going at the end of the concert with their global hit “Macarena”, turning the Vrijthof into one of the largest open-air dance floors in the world, crowned by an amazing fireworks display in the night sky over Maastricht. The Love in Maastricht DVD, for sale everywhere from March 22, reawakens the magic of these unique concerts. Prepare to be transported by the world-famous, romantic, and emotional melodies as well as the countless surprises and plenty of good humour. Experience André Rieu with his famous 60-piece Johann Strauss Orchestra, international sopranos, the Platin Tenors, and Los del Rio in a veritable fireworks display of emotions in the Netherlands’ most beautiful square! 138 min of pure entertainment!